After his departure from New York two years ago to meet up with his almost-fiancée, Zayne Beckett is the last person Agatha Watson wanted to stumble upon in her travels as a reporter with the New York Tribune. Quite pathetically bedraggled, he clearly needs to be taken in hand and sent back East to his family. Although she no longer has feelings for him, Agatha realizes, by hook or by crook, she’ll have to be the one to get the obstinate man home. Agatha Watson is a reporter for the New York Tribune— a somewhat odd profession for a woman in 1883 but one that perfectly suits her. She gets run out of the city after several attempts on her life and along with her bodyguards, gruff Mr. Blackheart and sweet Drusilla, travels to Colorado to lay low for a while until the perpetrator is caught. The last person Agatha expects to run into is Zayne Beckett, the man who broke her heart two years prior when he left to marry another. Deciding that Zayne needs her help, she is determined to make sure he gets safely home to his family. But getting him home means stepping straight into the lions den. Will Zayne and Agatha stop their exhausting arguments and witty banter for a moment and finally admit their feeling for each other? And will Zayne be able to protect Agatha from dangerous enemies? First things first I should mention that when I initially got a hold of this book I had no idea it was part of a series…let alone book four. Still, knowing that my to-be-read pile didn’t allow me to read the first three books for the time being, I decided to just go for it and hopefully not be too confused. I was happy to find that it was perfectly fine as a standalone novel (though now I’m really curious to read the stories of Felicia, Eliza, and Arabella)! I’m really glad I went for it because A Match of Wits was laugh-out-loud funny and kept me entertained from the first page to last. I’m a huge fan of Jen Turano’s witty writing style…this is my first book from this talented author and I’m really excited to read more. The plot was entertaining, although not as suspenseful or scary as I thought it would be which was a bit of a disappointment since I like my action. My favorite thing about the book? The characters! Agatha and Zayne’s witty banter was hilarious. I can’t tell you how many times they made me giggle. I loved how I immediately became invested in the story because I liked them so much. 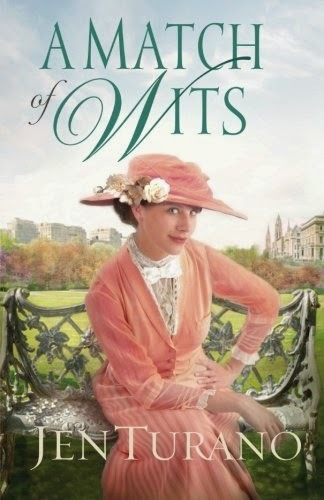 Overall I thought A Match of Wits was a fun read— witty writing, interesting historical setting, exciting story, and hilarious characters. If you enjoy fun historical romances that make you laugh, you should check out A Match of Wits and the Ladies of Distinction series. I will definitely be reading A Change of Fortune (#1), A Most Peculiar Circumstance (#2), and A Talent for Trouble (#3) the next time I’m in the mood for historical! **I received this book from Bethany House Publishing in exchange for my honest review. All thoughts are completely my own.